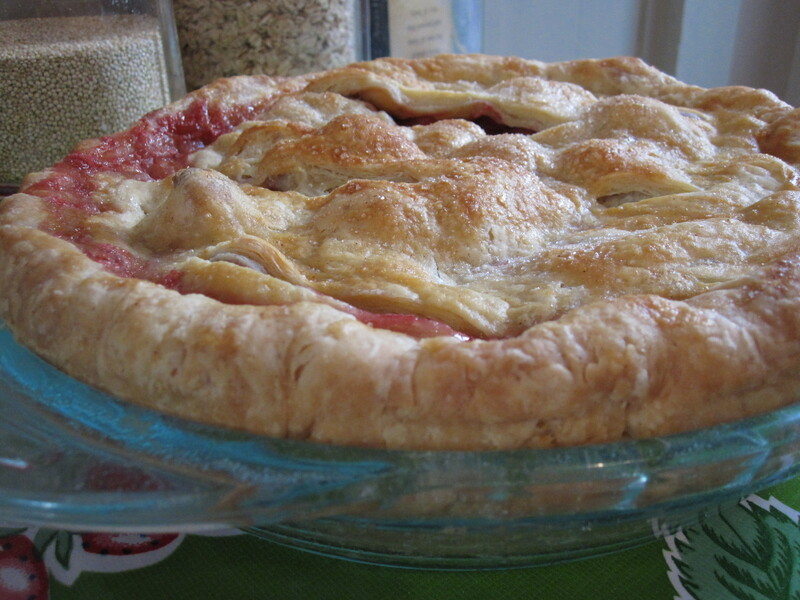 This is the first strawberry rhubarb pie I have baked. 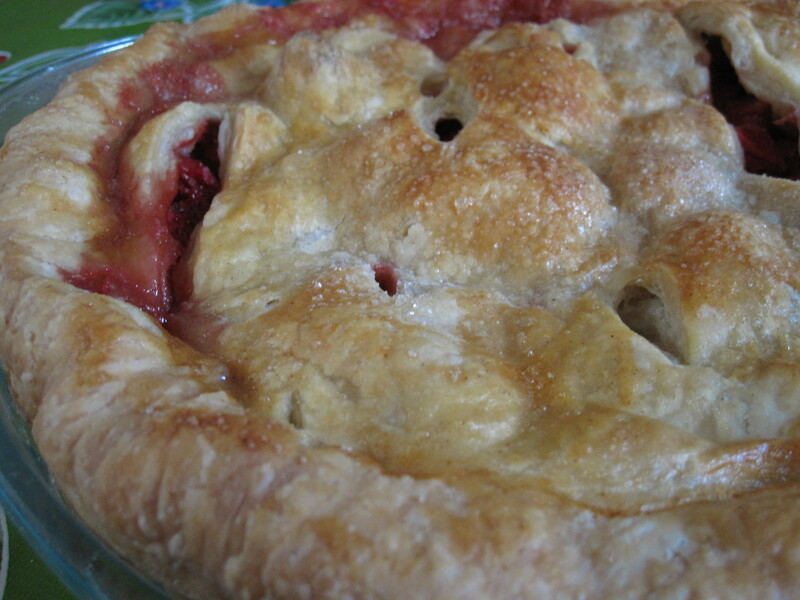 It may even be the first strawberry rhubarb pie I have eaten. And it’s definitely the first time I have ever touched a stalk of rhubarb. This bizarre red vegetablefruit with poisonous leaves that seems to have been miraculously designed by the pie gods to blend harmoniously with strawberries to create what so many consider to be their favorite kind of pie. I’ve had a somewhat strange association with rhubarb since the time I lived and interned in Paris for the summer after freshman year of college and stayed with an eccentric, over-bearing french “maman” named Maïtou who ate rhubarb preserves out of the jar while telling me about how the neighborhood was being taken over and trashed by the Algerians. As if letting me in on a big secret, she shared with me that rhubarb was her all-time favorite treat, and that the best brand was Bonne Maman, whose high-quality jams and preserves were some of France’s finest products. With each spoonful of the bitter jam she would grin with delight like a kid on a sugar high licking the frosting off a spatula. It’s this vivid memory of my summer in Paris, the enchanting city of lights and terrible weather, and of Maïtou, the bleached-blonde, permed, middle-aged Frenchwoman who served breakfast of baguette and nutella to me everyday, that comes flooding back to me when I encounter rhubarb. It’s the tiny 2 bedroom flat on the 5th floor with the TV always blaring episodes of American soap operas that are a couple years behind. It’s the diatribes of how France just isn’t like it used to be, overrun by thoughtless teens and illegal aliens. Maybe it’s the fact that I never really had any encounters or associations with rhubarb before that I suddenly became so fixated on it. Maybe it’s because I was somewhat shell-shocked after surviving my first foray into living abroad that all the memories from those two months remain so vivid in my mind. But I think it might simply be that I could never fully understand what was so damn good about rhubarb that Maïtou practically drooled at the thought of her favorite post-dinner treat, and seemed to never be able to praise this tart, jam-like item enough. Quite frankly, I thought it tasted like sour weeds. Really Maïtou, I thought, you live in la france, the country of endless delectable cheeses and éclairs and tartelettes and wines, and yet rhubarb preserves are the one thing you can’t get enough of?? Some mysteries are never meant to be solved. The mystery of Maïtou’s obsession with rhubarb is one of those. As is, I suppose, the mystery of why such an odd little celery-like vegetable (fruit?) with poisonous leaves happens to go so nicely with everybody’s favorite juicy red summertime berry. Whether it’s a strawberry rhubarb pie or a kooky Frenchwoman and her rhubarb preserves, the quirkiest of combinations often turns out to be the one you can never forget. Stir together rhubarb, strawberries, sugars, lemon, rosemary, salt and tapioca in a large bowl. Mound filling inside bottom pie crust and dot with bits of unsalted butter. Roll second half of pie dough into an 11-inch circle and cut decorative slits in it. Transfer it to center over the pie filling. Trim top and bottom pie dough so that their overhang beyond the pie plate lip is only 1/2-inch. Tuck rim of dough underneath itself and crimp it decoratively. Transfer pie to a baking sheet and brush egg yolk mixture over dough. Bake for 20 minutes then reduce temperature to 350°F and bake for an additional 25 to 30 minutes, until the pie is golden and the juices bubble visibly. Transfer pie to wire rack to cool. When fully cool (several hours later) the juices gel. 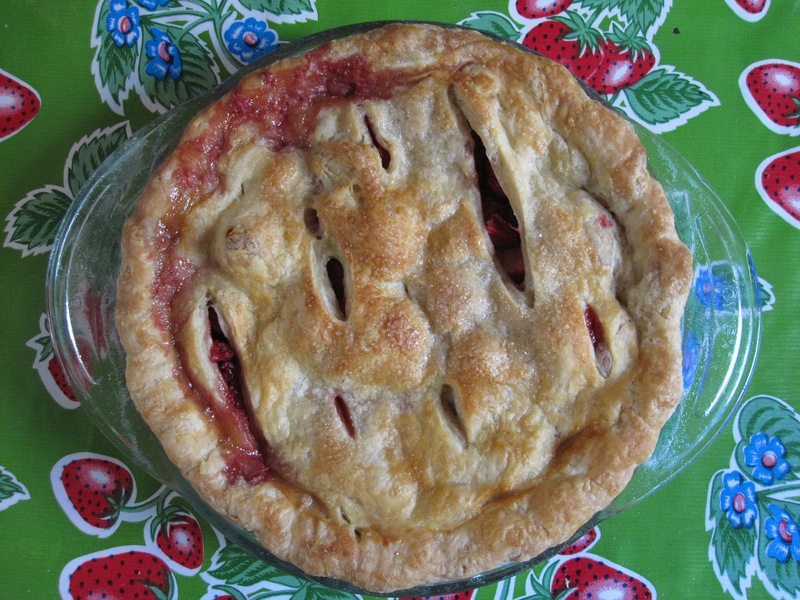 This entry was posted in Pie and tagged butter, pie, strawberry rhubarb. Bookmark the permalink.